Madeleine McCann's father says he remains ready to testify in a £1m libel case against a former Portuguese police chief after a hearing was cancelled. Madeleine was three when she disappeared from her family's apartment in the Algarve in 2007. Gerry McCann hopes to tell a Lisbon court that a book by Goncalo Amaral defamed him and his wife Kate. A judge cancelled the latest hearing because one of the lawyers could not be present. Mr McCann flew to Portugal with his sister Trish Cameron, who had been due to testify on Friday. No decision has yet been made on whether Mr McCann will be heard. Under recent legislation, plaintiffs in civil proceedings may now testify in their own case, but it is unclear whether the change applies to this action, which was lodged in 2009, before the new law took effect. Mr Amaral's lawyer, Vítor Santos Oliveira, made a written submission to the court stating he could not be present because of a medical procedure involving a member of his family. But the judge waited until the morning of the hearing to cancel it. The McCanns, who are from Rothley, Leicestershire are suing Mr Amaral for claiming in his 2008 book that Madeleine was dead and her parents concealed what had happened to her. Mr McCann had hoped to tell the court what the couple have long argued - that the book and accompanying film have made the public less inclined to help them find their daughter. He told journalists after the judge's decision: "Kate and I know better than anyone else what we've experienced and what we've gone through, and the facts of the file, and the damage that's been caused to the search for Madeleine. I'll do what it takes." 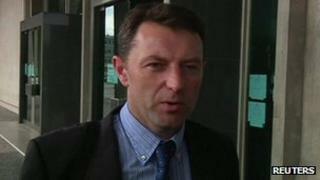 The McCanns' lawyer, Isabel Duarte, said it was important that he be heard. She added: "I asked because I don't have two witnesses that I have appointed, so I have asked the court to substitute the two witnesses by Gerry, because nowadays he can give evidence." Ms Cameron said she would travel to Portugal again to give evidence "if it's required". She is now expected to be heard on 2 October. The trial had already been subject to delays, and extra dates have been scheduled into late November. As part of the same case, the McCanns are also also suing Mr Amaral's publisher, the producer of a documentary based on his book, and the broadcaster that screened it. Lawyers for the defence are expected to argue that the book and film are not libellous under Portuguese law, and that they are based on the case files of the original criminal investigation.